If you want more traffic for your site, you’ve probably thought about viral marketing. It’d be great if every blogger in your niche was shouting about your brand. But first you need to make them aware of you. This is a challenge in itself. After that, you have to start establishing a relationship. Today we’ll run through some of your options for blogger outreach tools. What are Blogger Outreach Tools? Well, the clue is in the name really. These are platforms which let you research and manage your blogger outreach. This usually includes searching for the best influencers, as well as sending out emails and monitoring success. Do you really need a specific tool for this? Probably. The alternative would be to find some bloggers with google and start sending out emails manually. This is OK if on a small scale. Or maybe if you’re a giant multinational bloggers will come to you themselves. However, for sites with a healthy visitor rate of say 1-10k a month, a dedicated blogger outreach tool is your best bet. To help you get started, we’ve put together a comparison of 7 of our favourite blogger outreach tools. There are plenty of options out there. Before we go into each in detail, here’s the executive summary. Ninja Outreach $52 a month Powerful search options. Limits on number of contacts. BuzzStream $24 a month Very cheap. A little buggy. PitchBox $195 a month In depth analytics. Very expensive. BuzzSumo $79 a month Additional features. Slightly unintuitive. GroupHigh $99 a month Easy reporting and analytics. Cluttered interface. Klear $249 a month Depth of data available. Very expensive. MailShake $29 a month Very cheap. Lacks search function. That’s just a quick overview of course. I’m sure you’ll have noticed that there’s a wide range of prices. Let’s take a look at each in a little more detail and see if this translates to better platforms. First up is Ninja Outreach. Regular readers may even have seen our review of this last month. With plans starting from $52 per month, it fits nicely into the lower mid range of the market. There are two aspects of Ninja Outreach which, in my opinion, make it very attractive. Firstly, it has a lot of flexibility when it comes to searching for influences. In fact, it’s the best of all of the blogger outreach tools in this respect. In a very intuitive UI, you can filter results by several key points. These include the services on offer and what contact details are available. You can also set thresholds for key metrics, like monthly views. The email features are strong too. You can create your own templates to send out. When you find a lead you’d like to contact, their details populate automatically. This makes reaching out to bloggers a matter of a few clicks. You can also automate this so that a set number of emails go out per day. BuzzStream is the cheapest of today’s blogger outreach tools at $24. That’s not to say it’s necessarily light on features. Its search interface is fairly similar to Ninja Outreach in that it lets you add many of the same filters. It’s not quite as intuitive though, and it takes a little bit of digging to access all of the features. In theory the email side of things works the same way too. It’s a little bit more problematic though. While you can create custom templates, there’s no option to edit them. This means either starting again or editing on an email by email basis. This isn’t the end of the world, but it is a little bit annoying. BuzzStream also has a bit of a reputation for being buggy. Some users report data loss, or problems with reporting whether an email has been opened. I didn’t experience this, but I did find that the system was slight prone to freezing. PitchBox starts from $195 per month, so it’s approaching the upper end of the price range. Indeed, it seems to be more geared towards marketing agencies, or at least larger brands. It’s expensive, but you do get an awful lot for your money. The question is really if you need that level of functionality. One of the more luxurious is automatic following up. After a set period of time, PitchBox will send a follow-up email to anyone who hasn’t already responded. To their credit, they boast that their users get an average response rate of around 62%. The level of analytics on offer is really impressive too. You can of course keep track of the success of your campaigns. 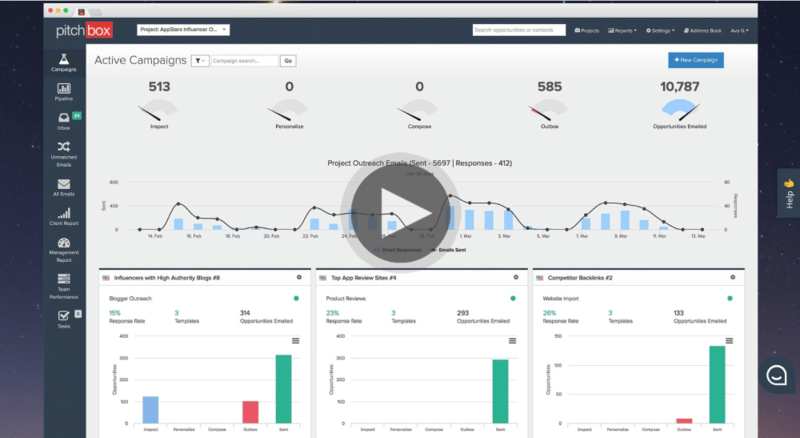 Additionally, since PitchBox is mainly aimed at agencies, you can also track your team members performance. This is great for maximising their productivity in a big team. Starting at $79 per month, BuzzSumo is firmly in the midrange. That means it might be more appropriate for sites with traffic numbers around 1-10k a month. It’s great for small teams too. Even at the lowest tier, you get 5 separate accounts. 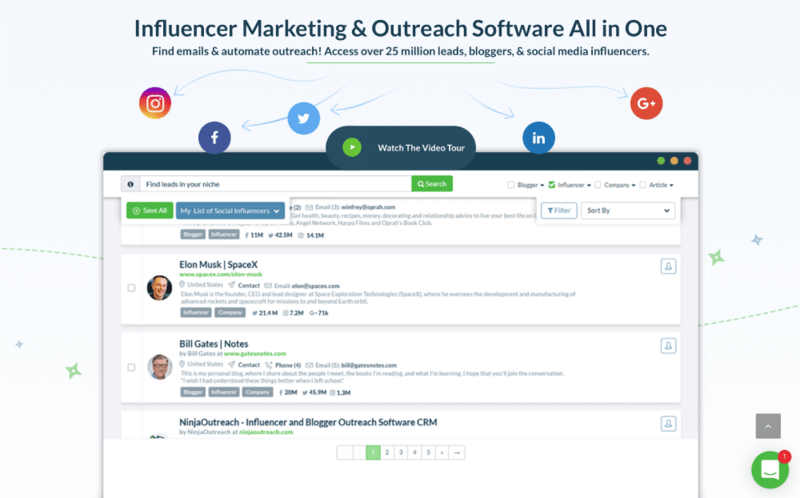 BuzzSumo offers more additional features than the other blogger outreach tools. In fact outreach is just one of its uses. You can also use it to plan your content strategy by searching for commonly asked questions on forums and message boards. You can also analyse existing content from other sources to see what performs well. This is great, but it comes with a slight reduction in usability. The platform is a little bit more difficult to navigate than some of the others. This isn’t a deal breaker by any means, but it does steepen the learning curve somewhat. With options starting from $99 per month, GroupHigh is another very attractive option in the middle of the market. Unlike its nearest competitor on price, BuzzSumo, GroupHigh is a pure blogger outreach tool. I really like the ‘Blogger CRM’ feature, as this makes it quite simple to organise your contact lists and manage correspondence. My only criticism is that the UI here isn’t the most attractive, and sometimes it feels like a lot of information is being squeezed in to a small space. The level of reporting options is really impressive. You can easily view engagements on individual platforms, as well as the combined total. This is known as the ‘All Media Report’. There’s also integration with Google Analytics on offer, so you can really get to the bottom of what works and what doesn’t. At $249 per month, there’s no denying that Klear is pricey. However, if you’re able to splash out, you do get an impressive product in return. I think part of the justification for Klear’s high price is the fact that it’s constantly improving and incorporating new features. As far as blogger outreach tools, Klear is about the most powerful platform out there. In fact, it currently operates on 5 years worth of historical data. That means that if there’s something to be known about a given blogger, Klear knows it. Knowledge, famously, is power. They also analyse individual influencers in depth. Since they score bloggers based on their success on different platforms, you can be sure that you’re able to find the right people to reach out to. Last up, we have MailShake which starts from $29 per month. One caveat is that this isn’t exactly a blogger out reach tool as such. It is however, a tool which could be used for blogger outreach. In fact, MailShake is more aimed at sales teams. It’s essentially a cold email platform. That means none of the searching functions of the other tools. If you’re acquiring your influencer data elsewhere however, this could be a great option. MailShake also include A/B testing, which is massively valuable for making sure you’re getting your pitches to influencers just right. It has all of the other features you’d expect from an email automation platform, including real time tracking and automated follow ups. For me there are a couple of blogger outreach tools here. We’ll discount the two more expensive platforms for now, as they’re probably surplus to many readers’ needs. At a more moderate price, I was really impressed with both GroupHigh and Ninja Outreach. I’d also like to give BuzzStream another special mention. At such a low price, it could be a great way to kick of your influencer marketing journey. The reason we write these articles is because we run lifetime deals of software for our audience. To get access to these deals head over to our homepage and sign up to the email list. You can find more software reviews on the Launch Space blog.